You don’t need a full-sized helicopter on stage or a cast of hundreds to tell a good story. Just a few great actors, a well tuned script and occasionally a clever set. 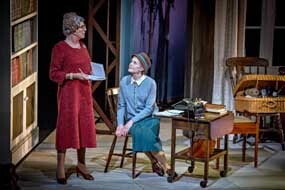 Such is the case with Murder, Margaret and Me, writer Philip Meeks’ terrific three-hander which grips me at York Theatre Royal one Saturday night. Though she might not be my first choice to play Margaret Rutherford, we all know Susie Blake has impressive comedic skills as she proved with Victoria Wood’s shows 30 plus years ago. And years on Corrie are testament to any actor’s abilities. So while she might not look like Rutherford, she captures the essence of the woman. A gloriously eccentric actress with a fondness for stuffed toys, haunted by her time in India. The ‘Rosebud’ moment or (Indian) elephant in the room as to why she’s so eccentric, of course, is the hook which keeps us all watching. 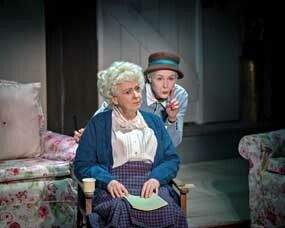 Margaret may not have been Agatha Christie’s ideal Miss Marple in the 1960s, but the friendship between these two artists is so beautifully realised by Susie and Nichola McAuliffe, it proves a wonderfully immersive experience. The latter has long been one of Blighty’s best actresses since her days on ITV sitcom Surgical Spirit. Theatre fans will have soaked up her countless performances over the years, but for me it’s a treat to see her commanding the stage on this crisp winter’s night. She’s such a perfect fit for Christie, I’ll find it hard to watch the movie Agatha again without picturing her in the role. (That Michael Apted movie is a must-see for the uninitiated and not a bad way for newcomers to ease into this story). Andrina Carroll might be less well-known, but her turn in locally shot movie The Knife That Killed Me, along with a wealth of York Theatre Royal performances, ensure there is exposition and colourful support where needs be. Her turn as The Spinster is brilliantly handled. The sets are slowly constructed around the cast by a couple of stagehands, pieces of the jigsaw puzzle slotting together like Rutherford’s home, and then deconstructed once the mystery is over. It’s a clever move, while Prema Mehta’s lighting cleverly alternates between the sun-kissed nostalgia of Rutherford’s youth in India, to the domestic setting of her home and the harsh spotlights of a movie set. All great shows can be summed up by the split-second feeling once the final curtain comes down. If there’s a sense of relief and a rush for the door then the show has failed. I’m sad it’s over so soon after spending just under a couple of hours with three wonderful actresses and a final line which doesn’t feel contrived or forced. Just that last piece of the theatrical puzzle which leaves me hungry for more. Christie fans will no doubt have a field day spotting in-jokes, such as a reference to BBC Marple Joan Hickson, but you don’t need to be well-versed in her work or the movies of Rutherford. 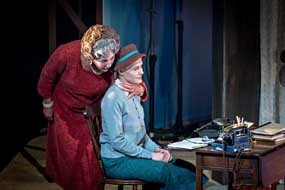 Murder, Margaret and Me is a glorious diversion which features a story as delicious as the pre-show meal I enjoy in the theatre’s Bistro 67 beforehand. As we head back to the car, my wife and I try and decide who gave the better performance of the two leads. But having analysed all the pros and (few) cons, we realise it’s a dead heat between them. Director Damian Cruden (a veteran of Berwick Kaler’s brilliantly bonkers pantos) and his cast are a reminder of why British theatre is among the best in the world. There’s no greater praise than the fact that we could happily watch it all over again.